This salad was part of the Chicken Potpie menu and complemented it perfectly. What with the apples in the potpie and the cranberries in this salad it had a nice note of Fall running through the whole meal. I absolutely LOVE salad and could eat it for dinner every night but the people I live with would probably stage a coup so I don’t. My daughter would say that we eat WAY too much salad (an interesting comment coming from a vegetarian) but I say that is not possible. I used a 5 oz. 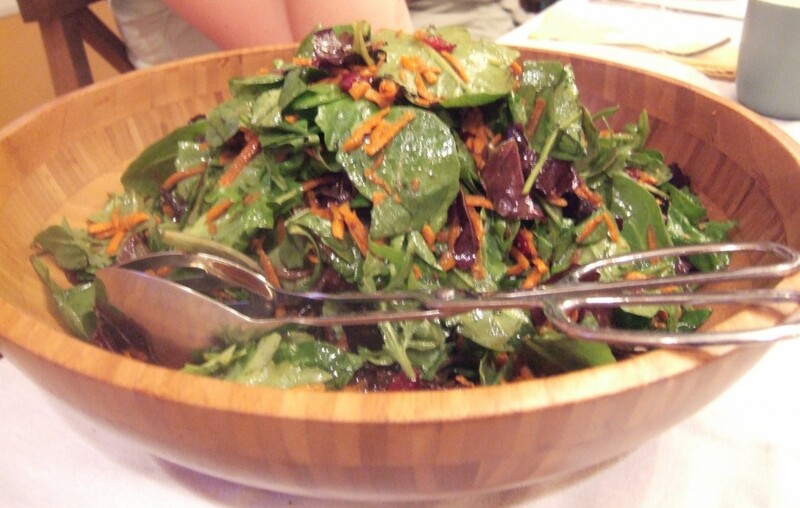 package of mixed baby greens, 4 large carrots, grated (4 cups), and 1 cup dried cranberries. Pam has two options for dressing and the simplest one is to just drizzle 3 tablespoons of olive oil, a little salt and pepper, over the greens and toss. Then drizzle 1 tablespoon balsamic vinegar over and toss again. Like the Giant Linzer Cookie, this salad is deceptive in its simplicity. It’s just delicious and quick and perfect with almost anything.